it is not a defense that I present to you. I am not in any way seeking to escape the reprisals of the knitting society in general and lace knitting society in particular for the mistake that I had made. I wish merely to give you an explanation of my acts and to tell you how I was led to perform it. I have been a lace knitter for a very short period of time. 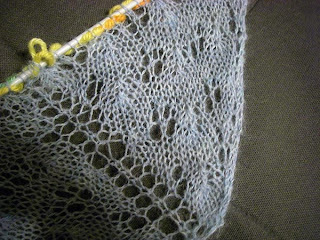 I started knitting lace on the 28th day of June, 2008. 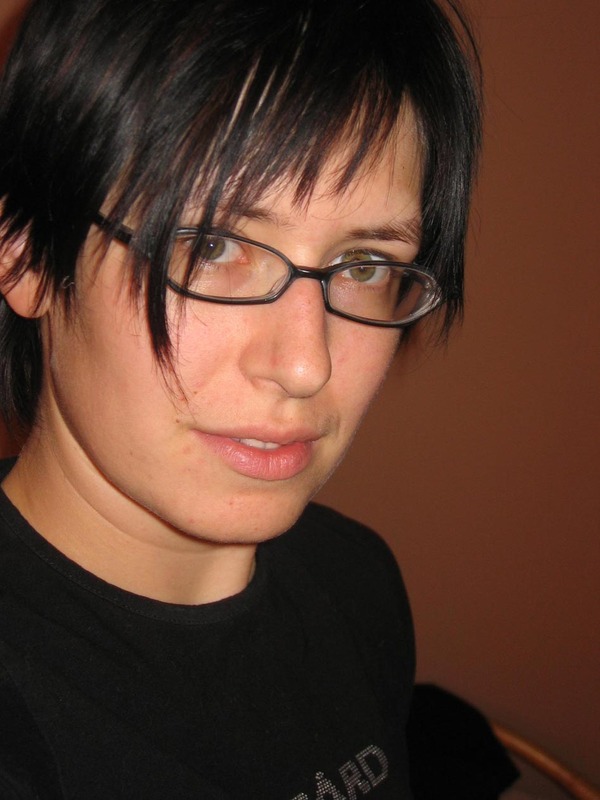 Since that day, my life had changed dramatically. 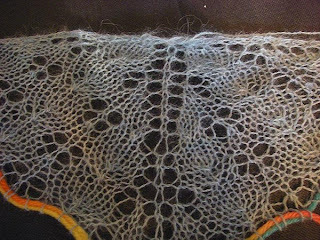 Everywhere I went, I saw lace patterns emerging in front of my eyes, I dreamed about lace, researched on lace-knitting, and spend every free minute of my time knitting lace. I would like to point your attention to the fact that lace knitting is addictive and that I was never warned about it. In fact, to prevent further incidents, I think that all products related to lace-knitting should bear a warning about it's addictive properties (similar to the warnings on the cigarette packages). As a previous smoker, I can also assure you that knitting is highly more addictive than smoking, which in turn is more addictive than such drugs as cocaine and heroine. 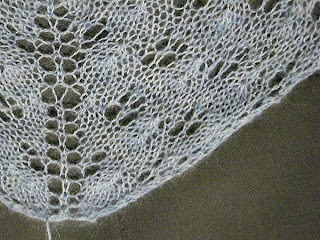 My previous statement informed you about an unhappy experience with lacy shawl, that took place on the 2nd day of July, 2008. This incident did not diminish my enthusiasm for the lace-knitting and I began a new lace project: the Print O' The Wave Stole on the same day. Previously, I had purchased 2 skeins of Alpaca yarn and this small fact can not be neglected. The presence of the second skein is the sole reason to why I did not rip out the swatch for the shawl, and kept looking at it, while working on the stole. I would like you to take in consideration the fact that the purchase of 2 skeins was not premeditative, thus I could not be held responsible for keeping the first swatch. When I looked at the star and followed directions of the arrows I felt very very stupid. I would like you to take in consideration the fact that I realized my mistake of not blocking the swatch correctly. 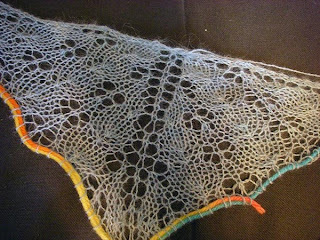 The shawl pattern started with 5-stitch row which I assumed to be the bottom of the triangular. I also earlier confessed to attributing "shawl is knitted from top down" instructions as a typo, and hope that it would diminish my punishment. I hope that this comparison will make you understand the frustration I experienced throughout this whole process. As it could be seen, the incorrectly-blocked swatch (depicted on the right) has a slight hint of the pattern, which causes a great trouble to the novice lace-knitter. Moreover, the horizontal position of the needles makes it counterintuitive to block the swatch in any other way. The casual cruelty of lace. It's shocking, No jury will convict you. Looks good! It's amazing how blocking it differently changed the patterning. Lace IS cruel, but is too much fun to give up. I really liked blocking. Can't wait to block the whole stole or shawl. Now I understand why they say that the yarn starts "blooming" after the item has been blocked. And thanks for the compliment. I think it will look even better when knitted with a slightly thicker yarn.